Farewell to the Ageless Fr. Ron Sams | Where's Fran? Fr. 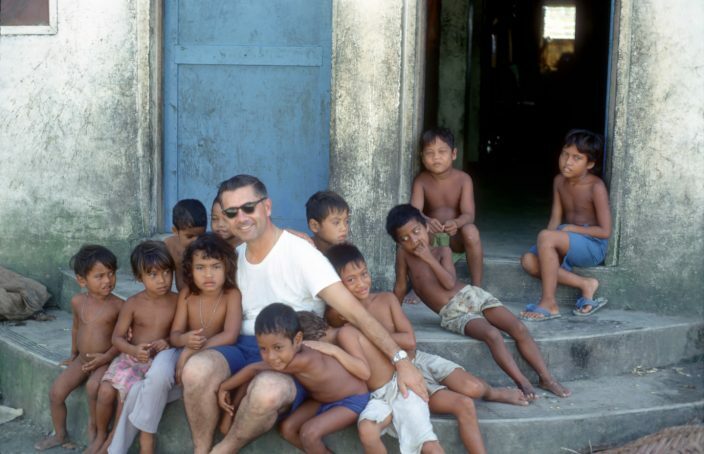 Ron Sams with children in Yap. 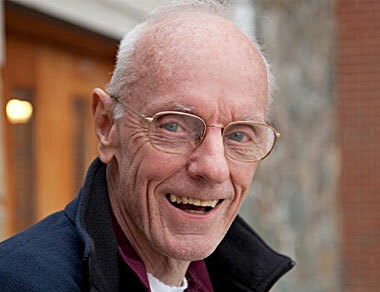 Against all expectations, Ron Sams departed from us for a better life on June 27. Most of us thought of the man as timeless, one untouched by aging. I suppose in later years his hair greyed and thinned a bit, but when you looked at the man you wondered if he would ever grow old. Ron’s spirit seemed just as impervious to old age as his body. His enthusiasm even in his 80’s reminded you of the quality that endeared him to so many in his younger days. Ron Sams was a boy scout in the best sense of that term–one of three Eagle Scouts working in Micronesia in the 1980s, with Dan Mulhauser and Tom Smith being the two others. 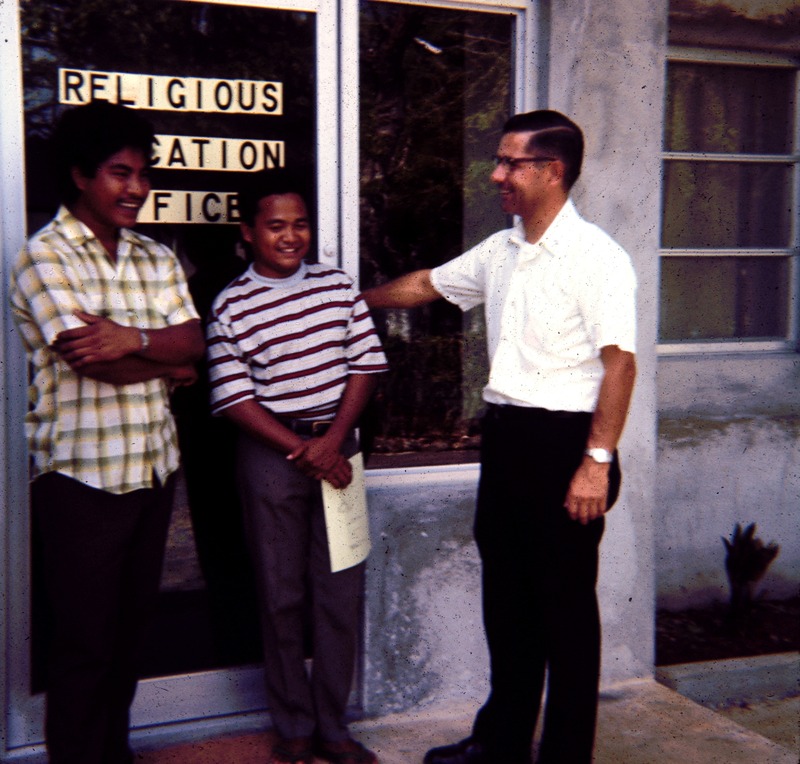 Ron’s contact with Micronesia began in 1960 when he became the head of the mission bureau for the newly formed Buffalo Province. Besides raising money for the Caroline and Marshall Islands, then under the care of the new province, Ron began a string of regular visits to the islands. Wherever he went, he always had a camera in hand, and his office became the depository for a growing collection of photos of our men at work in their schools and parishes. He also produced a half-hour film on the mission through the eyes of a young outer islander (Lambert Lokopwe) beginning school at Xavier High School. Ron in 1970 with two of his seminarians: Ketson Johnson and Apollo Thal. Shortly after our former Master of Novices, Marty Neylon, was named coadjutor bishop of the vicariate in 1970, Ron began an initial stint in the islands. He was the man you turned to when you suddenly needed a position filled. First he stepped in as the director of the new minor seminary on Guam, and then later on he handled the same job. Through most of his years in the islands, though, he served as the secretary and right hand man to Bishop Neylon. It was Ron, as much as anyone else, who moved us into the age of the computer. When computers were still big, clumsy machines with information stored on floppy discs, Ron was entering diocesan baptismal records into a central storage system. 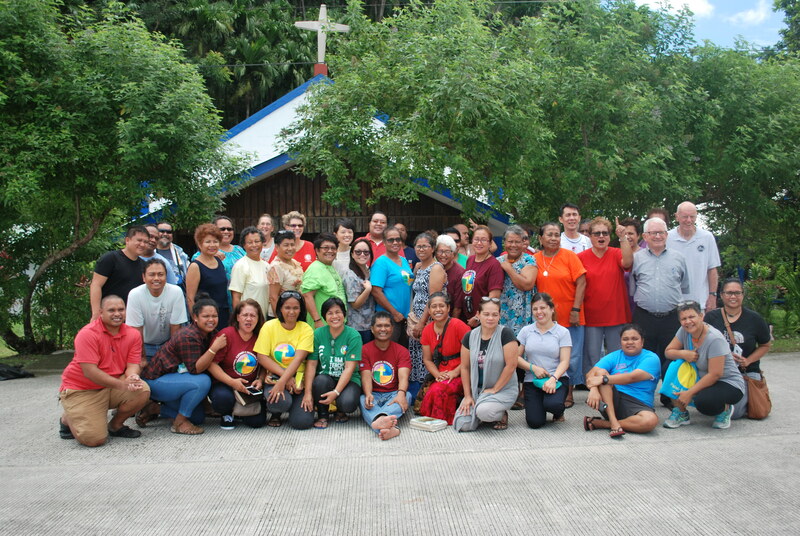 Ron with Bishop Neylon on a visit to an island in Chuuk. Somehow, after a day of tedious clerical work in the office, the man could show up in the rec room and at the dinner table with enthusiasm undiminished. Even the most jaded of us had to marvel at the freshness with which Ron seemed to see everything. Ask him to do just about anything, and he would accept. Spend a summer substituting for the pastor in some distant coral atoll? Ron happily did that more than once. Take the field trip ship to an out-of-the-way place for a special event? He had his bags packed almost before the words were out of your mouth. 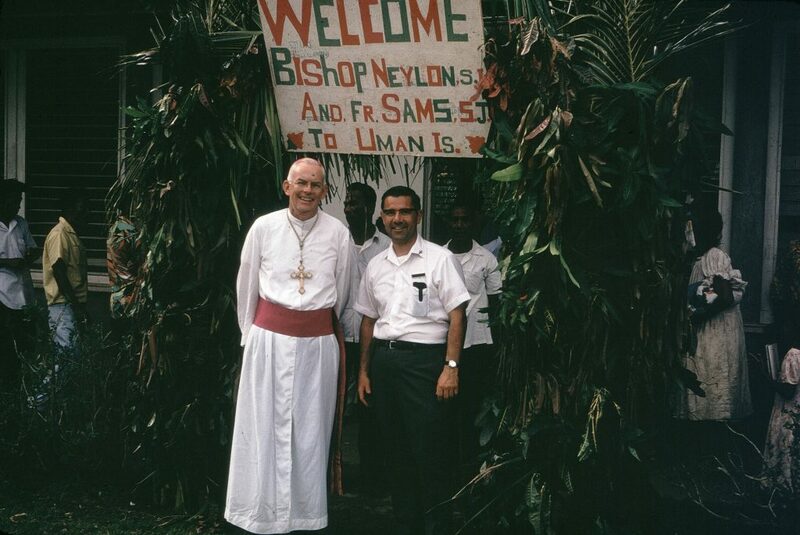 Then, in 1995, at the retirement of Bishop Neylon, Ron returned to the US with his long-time friend. There he began a second career (or was it a third or fourth career?) at St. Michael’s Parish. Sure, he served as pastor there for a long time, while managing to work on the annual fund-raising gig for Canisius High School. 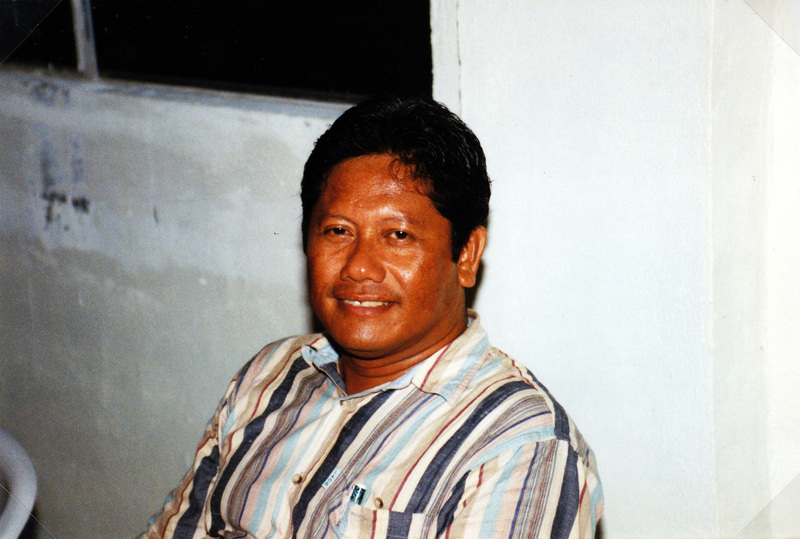 But we would still like to claim him as one of our own–a Jesuit who served Micronesia for many years and created his own legacy here in the islands. Ron never lost his enthusiasm, nor his hair, nor the deep spirit of unstinting service that had always distinguished the man. Let me join his many friends in the islands in bidding him fond farewell. 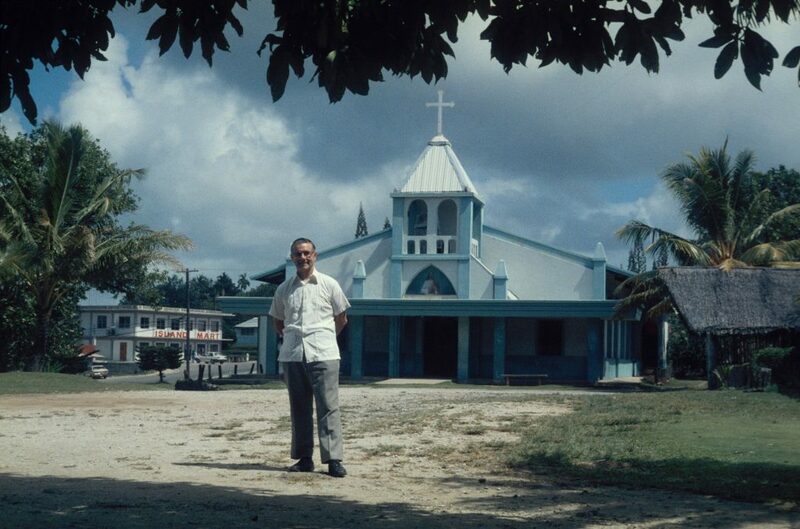 Ron standing in front of the church in Koror.